Open 11:30 a.m. to 9 p.m. 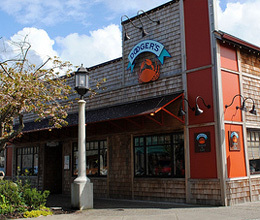 In summer 11:00 a.m. to 10:00 p.m.
Dooger's Seafood and Grill is the obvious choice for quality Seafood on the North Oregon Coast.Our menu includes everything from clam chowder, salmon, lobster, calamari, oysters, as well as traditional American fare like burgers, steaks, and pastas. We strive to maintain a relaxed atmosphere while serving the freshest and finest seafood to be found.